The implication CNN is trying to make, to people whom they obviously think of as complete idiots, is that Mitt Romney has been caught tacitly admitting that he doesn’t care about 47% of the American people. To put it crassly, that’s utter BS reporting. It’s lies. No wonder CNN and so much of the liberal media is failing. Clearly what he was saying (and he’s totally right on about this), is that his efforts as a candidate (his “job”) are wasted in trying to woo those 47% of voters who simply cannot be wooed by someone like him, who is running for President and earnestly trying to help the 47% and all Americans, by breaking the growing cycle of dependence on government which is enslaving Americans. It’s that growing dependency which is actually harming those people and holding back all Americans (including that 47%), and America as a whole. It’s the ugliest class warfare and outright lie I’ve heard from an American president and candidate, in my lifetime. Some people, who don’t pay income taxes anyway, would be hard-pressed to not vote for Obama, if Obama’s willing to take money away from what he has repeatedly castigated as evil “rich” people, who pay taxes, and give it to people who don’t pay taxes. Many among them wouldn’t vote against that, sadly. So why waste valuable time and resources, as a candidate, trying to woo them away from that? That’s what he was saying. You know that. And CNN knows it too. Now I think Ronald Reagan actually might have tried, by speaking in bold colors and explaining these things to people in such a compelling way that they’d actually win their vote, but that was another candidate at another time. Mitt Romney is making a perfectly credible campaign calculation in not “worrying about” trying to woo many of those now reliably government-dependent voters to his side, rather than just concentrating on the middle of the pack who aren’t yet taken in by the specious, left-wing rhetoric. Particularly when, as never before, the liberal media is, without even the pretense of objectivity anymore, biased and working hard against him (as we’ve seen here), and campaigning for their man, Barack Obama. 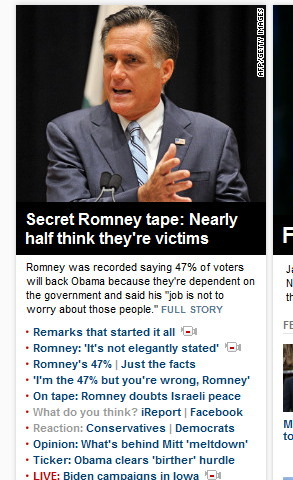 But just look at that CNN.com teaser at right, which is where I saw this nonsense. It’s replete with anti-Romney BS. That’s bad enough. But when a news organization which holds itself out to be a purveyor of truth purposely misstates facts and misrepresent the truth, it actually rises to the level of perfidy, I think. By the way, did you see the Tweet sent out by that CNN “reporter” Peter Hamby last week? The link is to a Barack Obama’s campaign web site where you’re invited to donate to his campaign to help crush Republicans. 8 Responses to CNN and others purposely misrepresenting what Romney said. The perfidy of the media is amazing. Did Billl O’Reilly write this? Yes. Yes he did. You nailed it. Who wrote your brilliant comment for you? I mean it’s so original. Man, you sure told me. I smell a Pulitzer. Again with the Pulitzer Prize-winning writing and superb intelligence. Thank you. It’s better than this garbage. Maybe you could develop your argument a bit better. Say, by explaining why you deem my article to be “garbage.” I mean at least call me a racist or something. I’m not arguing, just insulting. Most vacuous left-wing trolls don’t tacitly admit to being one. You’re especially bold in this regard. So good on you for being bold.